We have two daughters, Anastasia Grace “Anya” and Genevieve Adele “Vivi.” Last year, Anya told me there was a baby brother in my tummy. Turns out she was right! 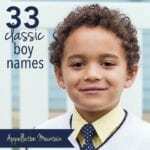 I’m a little lost on boy names, maybe partly because while I’m confident in what I like in girls’ names, I’m struggling to define or explain my boy name preferences. They feel pretty eclectic by comparison. We also have a niece who passed away recently. We’d love to honor Peyton, if possible. I have a giant list of names that I whittled down to fifteen. But that list feels like it changes minute to minute. My husband’s list of four or five names has all been crossed out for one reason or another. I still LOVE a lot of the names on the list, but haven’t gotten “that feeling” that THIS one is it yet, which makes me wonder if there is a name I haven’t considered. My husband is happy with Alaric and it’s not that I’m not. But I’m second guessing it. What a great story to tell your son someday – that his sister knew about him first! I hear what you’re saying about not knowing your style. It’s easy to get hung up on the question, of course. But it’s also tough to feel like any name could be on your list. They’re both traditional choices with a long history of use. And yet, neither name has ever been particularly common, at least not in the US. 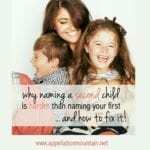 Both are nickname-rich names that work nicely in full, with lots of flexibility built in. 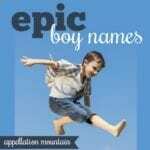 It seems like you might like boys’ names that fit this same general pattern: rooted in history and broadly familiar, but not too popular; nickname-rich but not so elaborate that the full name feels burdensome. On paper, Alaric sounds like a brother for Anastasia and Genevieve. Except. I can’t figure out how to shorten it. Al? Ricky? Rico? Lars? They’re all plausible, but not as automatic or perhaps even as appealing – at least for me – as Anya and Vivi. It’s also true that Alaric feels far less familiar than your girls’ names. And so I wonder if that’s why it’s never quite clicked? I’m going to take another pass at your long list, and see which names best fit the same general guidelines as Anastasia and Genevieve. I’ll add in a few more, too. Alasdair/Alistair – It’s not automatic, but I think Alasdair could be shortened to Alec. Though it seems like you’d rather not repeat an initial, so I’m not sure if this really goes to the top of the list. Sebastian – Sebastian might seem a little too popular for you, and yet I wonder if shortening it to Bastian would sidestep that issue? Callahan – One of my favorites. It’s not the same style as Anastasia and Genevieve, but the name’s length and rhythm make it feel compatible. It shortens to friendly, upbeat Cal or even Hal. It reminds me of Macallan and Calix on your list, too. If both are close-but-not-quite, how about Calvin, Calder, or another Cal- name? Dominic – I know that Dominic ranks in the US Top 100, and I’ve even met a few. But I feel like nothing sounds much like Dominic, and that makes it stand out. Nickname Nico feels edgy and bright, but Dom is an easy go-to choice, too. Donovan – It doesn’t seem like it’s one of your favorites, but Donovan called Van leaps out at me as a name that hits the same notes as Genevieve and Anastasia. Elias – Is Elias called Eli really off the table? It does rank in the current US Top 100, so perhaps it should be. And yet, I think it has potential. Everett – You’ve listed Everest as a guilty pleasure/middle name maybe, and I can see that. But how about Everett? It’s very similar to Everest, but far more mainstream. Evander might be a little more out-there, but it has potential, too. Finian – Looking at Finn immediately made me think of longer Finn- names. Griffin, maybe, if not Finian? Lucian – Lucian comes from the Latin lux – light. And Genevieve is the Patron Saint of Paris, the City of Light. It’s an appealing connection between the siblings’ names. Nickname Luc or Luke is pretty much perfect. And while it’s not directly related to Peyton’s name, the idea of light seems like an uplifting one, a very subtle way of remembering her life. Malachi – Malachi called Kai seems pretty close to perfect! Malachi is in the same popularity range as your girls’ names. And Kai seems like the kind of spunky, upbeat nickname that you prefer. Spelling isn’t ideal – it seems like it should be Chi, only that doesn’t really sound like Kai, right? Still, I think it works. Paxton – Strictly speaking, this surname doesn’t come from the Latin word for peace – pax – and it’s not related to Peyton. But it strikes me as a good choice to kind-of, sort-of approximate Peyton. And the meaning – peace – feels very appropriate, too. Wilder – William seems a little too conventional, but I can see that Wilder feels a tiny bit out-there. Would Wilder called Wil or Will be an option? Zachariah – I love the idea of Zachariah for your family. It’s a little bit different, but only a little. And Anya, Vivi, and Zach sound just right together. Zechariah – But if Zachariah is a maybe, would Zechariah be an option? Strictly speaking, Zechariah is the original, and Zachariah the variant from the King James version of the Bible. It comes from the Hebrew word zakhar – to remember, which seems fitting for your niece’s memory. It also shortens to Zeke, a nickname that might have some appeal. All of this – the meaning, the nickname, and the name’s familiar-but-uncommon status – but Zechariah at the top of my suggestions list. But if that’s not quite right, I’m most tempted by Callahan called Cal, and Lucian called Luc or Luke. I think any of the three work well with Arthur as a middle name, though Lucian Arthur might be my favorite. Let’s turn it over to the readers, because I know they’ll have all sorts of great suggestions, too! 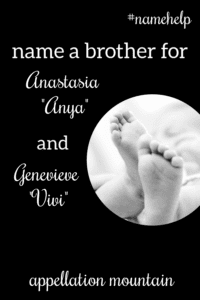 Readers, what would you name a brother for Anastasia “Anya” and Genevieve “Vivi”? I thought maybe Lysander, nn Sander? I keep thinking Lysander will catch on, but it hasn’t yet! Firstly, isn’t Payton a boy’s name anyway? Or would that feel uncomfortable? Peter and all its translations – Pedro, Petros, Pyotr, Pietro and so on. I am so thrilled to see the name Lucan discussed! It’s the name we chose for our son. We call him Luc for short as well. I know exactly which bad associations she’s referring to, but the name has a great meaning with so much beautiful symbolism. Also, there was a knight named Lucan in the King Arthur legend. He was Arthur’s most loyal and trusted knight who never left his side in battle. We felt the positive associations, both symbolic and literary, far outweighed the negative. It’s a truly unique name that still feels familiar, so as not to be burdensome in its uniqueness. Again, so thrilled to see Lucan on someone else’s name list!! I’m from The Netherlands, and ‘kip’ is the Dutch word for chicken. To us it is a funny name. And ‘kipling’ is very close to the Dutch word ‘kibbeling’, often pronounced as ‘kipling’, wich is a famous fish snack. Not as if it matters, but I though it was funny to mention. I’m going to throw “Gilbert” into the hat! If Lucan (I’m guessing pronounced with a hard c sound) and Lucian are both on this list, how about Lukian/Lukyan (pronounced loo-kee-uhn)? It seems to bridge the too. I’ve met one (he was Russian) and it wore really, really well! Lukian Arthur is great. I like the suggestion of Nathaniel, Everett and Evander as well. I’m in a similar boat…no names sound or feel right for our boy. We may name him Vanguard Malachi (Van or Kai as nn). I am sold on Hawthorne for you. It just feels right with the girls’ names. I am not sure the perfect nickname, though. I don’t love Hal. Maybe Ro? I think you could do Ace here, or any wild card name. The only downside is the flow with Arthur, but I wouldn’t let that stop me! Neither should you! I def like Donovan, nn Van, or Callahan, nn Cal, best from this list. I also like the suggestion of Beauregard, nn Beau. I recommend using two middles: Arthur Peyton. Calix and Callahan both made me think of Callixtus or its variant Callistus, which fit the length and sophistication of your girls’ names nicely, and the friendly nickname Cal is awesome. I feel like Lucian Arthur is the best style match and I personally love the name Lucian. Maybe Julian (Jules) or Victor. Anastasia and Genevieve both have a worldly quality that Lucian also captures. I’m so sorry about the loss of your niece. I would ask the parents’ blessing before using a recently lost child’s name on a new baby (and only ask if when/if you receive the blessing, you are 100% committed to using it). It might be a beautiful memorial or a tragic reminder. I would also only use it in the middle name spot for that reason. An alternative option is to give the baby the same initials Peyton had, even if it means letting go of the name Arthur. I would if Phineas would be a good fit for a first name since you like the nickname Finn? Since I don’t know what Peyton’s middle name was, I can’t comment on that, but you do have a long list of beautiful names to pick from. Harrison might suit you, too. Or what about Martin? His nickname could be Mars! Carlisle with the nickname of Lyle would be rad! (Even Carl would be respectable). Jeremiah with the nickname of Remy might suit. Best wishes! It’s been cool to read about your family growing. William might be too conventional for you, but you could go with a more continental version like Willem and still get the nickname Will. How do you feel about Harold? It’s a family name I’m planning on using for my first boy. I know it’s not everyone’s cup of tea, but it can also be a more unusual route to Harry. Peyton Arthur seems like the obvious choice, with Paxton being a good alternative. Pennington nn Penn would also be a subtle tribute to Peyton. If that doesn’t work, maybe double middles for Peyton and Arthur. I know that you have Caspian as a guilty pleasure, but I think it works really well with your girls. Anastasia, Genevieve, and Caspian. Anya, Vivi, and Cass. I think Everett Arthur sounds pretty perfect. Nn Rhett. It has the same vowel repetition in all three names, was popular in similar periods, and has a dynamic, debonair yet recognizable nn built in. Lucian Arthur is my absolute favorite from the list, but I also love Evander (nn Van) Arthur as well. Both names are distinctive, recognizable, stylish, and oh so handsome. Would you consider breaking your pattern and drawing a nickname from the middle spot? If so, what about Arthur Peyton nn Pacey? It would be a nice way to use both honor names while giving him a nn that [hopefully] you both find appealing alongside Anya and Vivi. Evander/Van is my pick too (tho then you have to V nicknames). Perry could be another unexpected nickname if you did Arthur Peyton. Your daughters have beautiful names! I especially love Benedict, Dominic, and Lucian for you. I would also suggest Edmund. Are my favorites. While I like multiple syllable nn’s for girls, I much prefer single-syllable nn’s for boys. Love the suggestions above and your list! Your style seems eclectic, yet I like every name on your list! Two more suggestions that relate to names you love are Samson with the nickname Sam or Felix with the nn Fox. Samson Peyton Arthur or Samson Arthur Peyton, Felix Peyton Arthur or Felix Arthur Peyton. I’d do Peyton as a second middle with Arthur for the honoring purposes. I think it’s great to give this child 2 middles for the sake of honoring.